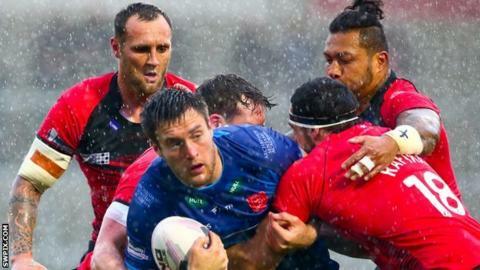 Salford and Hull KR played out a draw in difficult conditions that ended both sides' losing runs in Super League. Rovers, without a win in two, led at the half-way stage after Kris Welham and Kevin Larroyer tries, with Francis Meli in reply for Salford. Meli grabbed a second to level after Jake Mullaney's kick for the Red Devils, on the back of four losses. KR's Neville Costigan and Salford's Martin Gleeson shared a try apiece as the game edged to deadlock. Iestyn Harris' side hit the front early when although Junior Sa'u was held up by Ade Gardner, Rangi Chase eventually looped the ball wide to Meli for a score. Welham dummied back inside to cross for Rovers and as a wet ball in soggy conditions brought errors, Larroyer capitalised as Mullaney failed to gather a kick close to his own line. That brace of tries ensured Hull KR went in ahead at the hooter but found themselves on the wrong end of decisions after the break from referee Phil Bentham. First Red Devils back-rower Gareth Hock was bundled into touch and the tackle was penalised in Salford's favour, then Liam Salter looked to have been carried over his own line to force a drop out and Meli's second score served only to infuriate the visitors' support. Despite the match moving in Salford's favour, full-back Mullaney again spilled a kick and this time Neville Costigan scooped up to pull Craig Sandercock's side back ahead. Gleeson picked up on a Rovers spill by Hodgson to dart over and once Mullaney slotted the conversion the scores were level again. Costigan tried to force his way through for a second try but the attempt was ruled out despite going over, and the two sides traded drop goal attempts with Chase's effort rebounding back off the frame of the posts. Hock burst through late on to lift Salford hopes but failed to find the pass needed for the supporting Mullaney and time ran out. "There is a feeling of frustration. There were some pleasing things. I thought defensively we looked comfortable and that's probably the first time you could say that all season. "We want to improve that and then make some adjustments with the ball. I think there were some small improvements. "We're disappointed not to get the two points but it could have gone the other way as well. There were some good lessons for us." "It was a good game - we had an awful lot of defence in that second-half. Even their try in the corner it was out so we defended really well today. "One day this team might get a little bit of luck and when we do get maybe a touch of luck you'll see a really really good Hull Kingston Rovers. "We need to dust ourselves off, Salford are a big side and a physical side so there's a few bruised and battered boys in there so we'll dust ourselves off and train well next week and see what happens." Salford Red Devils: Mullaney; Williams, Gleeson, Sa'u, Meli; Chase, Fages; Griffin, Tomkins, Tasi, Hansen, Hock, Puletua. Replacements: Ashurst, Morley, Rapira, Howarth. Hull KR: Cockayne; D. Hodgson, Welham, Salter, Gardner; Burns, Keating; Netherton, J. Hodgson, Weyman, Larroyer, Cox, Costigan. Replacements: Langley, Green, Lovegrove, Hall.